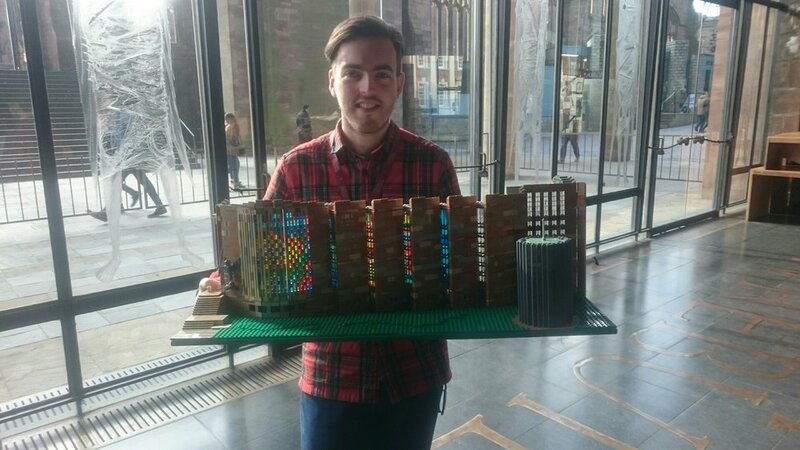 The other week saw the delivery of a bespoke LEGO model which will become a focal point of Coventry Cathedral centenary celebrations. Tim Latham ( the Dean's Administrator) takes delivery of the model. The ' cutaway ' model features a fully detailed interior, along with the huge tapestries which are a major feature of the Cathedrals interior. The model has been painstakingly created to scale with a full set of the colourful stained glass windows - another detail for which the Cathedral is well known. The model will become part of the 'Massive mini churches project' - All churches in the diocese, which covers Coventry and Warwickshire, will create a model of their own church, many communities will enroll schools and groups to assist in this task, the end result will be a huge physical map of the diocese to be displayed in Coventry Cathedral, where the LEGO model will be the centre-piece. It is hope many church models will be completed and in position upon the map in time for for the Archbishop of Canterbury's visit on May 5th - so pop along if you are 'sent to Coventry'.